Why Purchase an Expandable Hose? Why are expandable hoses so popular? Conventional hoses can be a real pain to use. Do you remember the last time you tried to use a normal hose? They are often very heavy, prone to kink, difficult to store and very unwieldy for seniors and children to use. The only real thing they have going for them is that they are more durable than their expandable cousins. Expandable garden hoses are made in 25, 50, 75 and 100-foot lengths. Almost all of them now use brass fittings for added durability and all reviews on this page include expandable hoses made with brass fittings. Many hoses also include shut-off valves as well. By doing a little research, finding an expandable hose for your use should be easy. 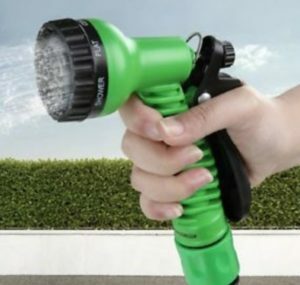 If that conventional hose is getting you down and you are tired of dragging it around, reeling and unreeling it, battling those kinks and want to make gardening a more pleasurable experience, an expandable hose could be the answer to your woes. Below are 3 of the best expandable hoses available, all reviewed, if you want to purchase one without further adieu. After these reviews, we go into more detail about this type of hose, so that you can make a more informed decision about their advantages and disadvantages. Virtually all purchasers of these hoses include a small subset of people who have had them spring a leak or burst. This is just a testament to the fact that they need to be treated with care. Read all information included with your purchase and follow it closely – the integrity of your hose should thus be maintained. Note: Most expandable hoses work best if you have good water pressure ( That means high ). If you have low water pressure, you may not get the hose to extend to its full length. This 100 footer is manufactured by Homeme. It is advertised as using the newest and best quality materials which are there to efficiently protect the vulnerable inner latex pipe. Tests, presumably carried out by the manufacturer, show that the hose has a prolonged service life of 1000 to 1500 uses compared to other hoses with 500 to 600 uses. Its outer fabric is made of the strongest material on the market and of course it has solid brass fittings like all hoses on this page. hose it comes with a spray gun with a 9-pattern spray nozzle. This 50 foot expandable hose from Tacklife is another premium product but it does not come with a spray gun – adding a spray gun gives you a similar, albeit shorter, product to the one above. Like all the hoses on this page it has solid brass fittings which handle the water pressure better, avoiding leaks. According to the blurb, it has an innovative leakproof design which consists of a double-layer latex with an outer layer of high strength polyester. They claim that the life of their hose is 40% better than comparable hoses. The vibrant orange colour of this hose might be attractive to some but gaudy to others – each to his or her own taste. The hose is a new design and is manufactured in such a way that makes it less likely to tangle or twist. It comes with a Net Bag for easy storage, a 3/4-inch & 1/2-inch tap and a user manual. This hose is a mid-range product. It is manufactured by Koopower, and it comes in at a length of 50 foot. It has the all-important brass connectors and is described as frost-proof and weather-resistant by the manufacturer. It has a kink-free design ( coming from its knitted durable outer-layer ) which ensures freely flowing water when in use and which also makes it easier to store. Expandable hoses are much more easily stored and moved around. You can hang your expandable anywhere around the garden. Put it on a hook, or even store it in a bucket. Most expandable hoses are kink-free. The days of constantly manipulating a conventional hose to get the full water pressure could be over. If space is a premium then an expandable hose might be a great idea. Plastic fittings that come with an expandable hose wear very quickly. This can be remedied by buying one with durable brass fittings. Even the best ones are less durable than conventional hoses. They simply need a little bit more care to maintain. If your water pressure is too low, an expandable hose will not be for you. Expandable hoses differ from traditional hoses in that they have an inner membrane which expands when filled with water – like a balloon. They have an outer cover which protects the delicate expandable membrane from punctures. The hose expands when pressurised and shrinks when the pressure is released. Because they shrink when not in use, it allows for easier storage. Modern expandable hoses have two or even three layer inner membranes for added strength. These are usually made of a rubberised material such as latex. The drawback of more layers, of course, is that the hose weighs more, but new materials are being developed all the time for added durability, strength and lightness. Should You Buy an Expandable Hose? Before you purchase an expandable hose, the simple question you must ask yourself is “do the negatives outweigh the positives?” So, let us summarise the positives and negatives of a conventional hose and the positives and negatives of an expandable hose. Ease of Use: An expandable hose wins this category hands-down. They are more easy to manipulate, weight up to 3 times less than a conventional hose, and are much less prone to kinking and twisting. Storage: Conventional hoses take up more space – important if you have a small garden – but an expandable hose does need to be taken more care of as the winter draws near. Durability: Conventional hoses win this category, but the difference between the two types of hoses is narrowing all the time as technology moves on. Only the cheapest expandable hoses have a durability problem, especially if they come with plastic fittings. An expandable hose is certainly not as tough as a regular hose. You need to be more careful about the kinds of surfaces it is exposed to. Dragging your hose across gravel, for example, is not the sort of thing you should be doing as this can shorten the life of the hose. Think about how much abuse your hose will go through. Will it be stepped on? Will it be driven over? Can you store it properly? If the answers to these questions are no, then you may be better off buying a conventional hose. High water pressure will cause your expandable hose to wear out faster, but you can use water pressure regulators to lessen the water pressure. Too low a water pressure, of course, will not allow you to use an expandable hose. An expandable hose should be Kept out of the sun for prolonged periods as they can deteriorate over time. Keep it in the shade or even better, store it in a box. Expandable hoses are very easily stored in small places. Just like conventional hoses, an expandable hose needs to be drained and stored in a cool dry place during the winter. Freezing weather is not a friend to your hose. The best expandable hoses nearly always use brass fittings. Brass fittings last longer than plastic fittings on an expandable hose everything being equal. Plastic fittings are brittle, and if you do buy a hose with these more care must be taken – stepping on it is not an option. Use your common sense when using for your expandable hose. Its lower durability means that it just cannot the kind of abuse that people often mete out to their conventional hoses. Reading the tips here should make your expandable hose last longer. Before you buy your expandable hose make sure that you do your research. Read some reviews if you can – there are lots of these to be found on the Amazon website. What do people think about the hose that you are interested in? Probably the most important thing to ask yourself is “how will I use this hose and what sort of abuse will it take?” If you are happy using a conventional hose then perhaps an expandable one is not for you. Whatever you decide, I hope that this website has been of some assistance to you.